1Department of Pediatric and Preventive Dentistry. Saveetha Dental College. Saveetha Institute of Medical and Technical Sciences, Chennai, Tamil Nadu, INDIA. 2Department of Pharmacology. Saveetha Dental College. Saveetha Institute of Medical and Technical Sciences, Chennai, Tamil Nadu, INDIA. Background: There has been an increased use of natural products as medicament in endodontic treatment due to the increased adverse effect observed in chemical products used. The natural products used aims to disinfect the root canal and provide a sterile environment as efficiently as the comparable chemical products. Aim: To compare the antibacterial efficacy of cinnamon extract and calcium hydroxide as intracanal medicament against E. fecalis. Materials and Methods: The study is an in vitro randomized controlled study conducted on 40 single rooted permanent teeth. The study sample was divided into two groups- cinnamon extract as intracanal medicament and calcium hydroxide. The intracanal medicament was placed for 7 days. The outcome was measures using colony forming units per ml. Statistical analysis was done using Mann-Whitney’s test to compare between the two groups. Results: Cinnamon extract intracanal medicament showed higher antibacterial efficacy as compared to calcium hydroxide. (p=0.002). Conclusion: Cinnamon extract showed better antimicrobial efficacy against E. feacalis as intracanal medicament as compared to calcium hydroxide. 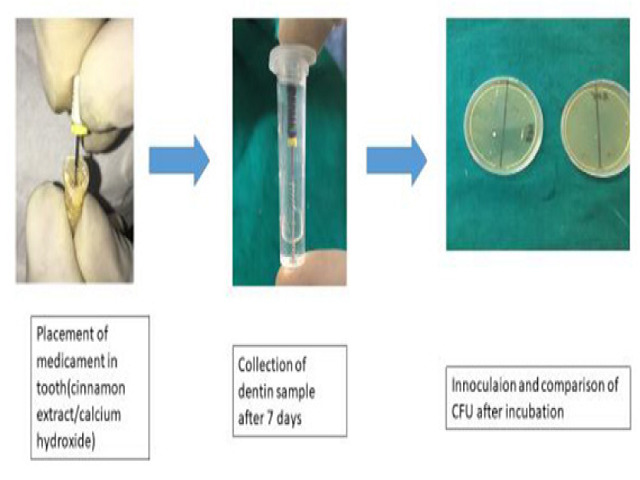 Panchal V, Gurunathan D, Thangavelu L. Comparison of Antibacterial Efficacy of Cinnamon Extract and Calcium Hydroxide as Intracanal Medicament against E. fecalis: An In vitro Study. Pharmacognosy Journal. 2018;10(6):1165-1168.